How $200k Can Seem Middle-Income in D.C. So what does our tax data say? A household making $200,000 could certainly be seen as rich. Among people paying local income taxes in D.C. in 2012, an income of $200,000 would put a person in the top 10 percent of all taxpayers. It is more than four times the median taxpayer income of $46,000. On the other hand, if you’re married and have dependents you might see things differently. The median income for D.C. taxpayers in this group in 2012 was $143,000. 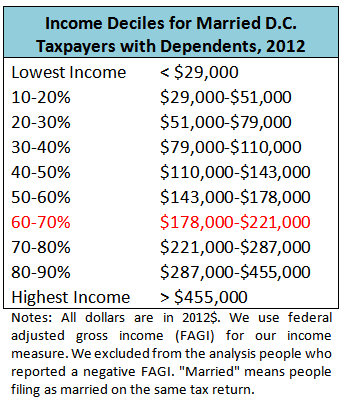 A couple making $200,000 would fall somewhere between the 60th and 70th percentile of the income distribution. If you’re married with kids and so are your peers, you might well conclude that an income of $200,000 is close to the middle of your peer group. < Previous Contributions: who gives? Next > Who are the biggest employers in the District? A $200,000 income after deductions is rich. Period. The table is AGI, not income.